The Boston Consulting Group projects 25% of miles driven in the US by 2030 (just 13Ys) will happen in self-driving cars. That makes some sense, when you consider autonomous vehicles can reduce travel costs by a projected 60%. 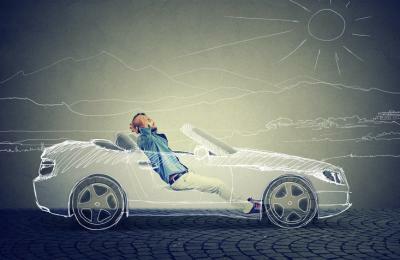 Who knows, perhaps the next car you buy could be your last one, so choose wisely and enjoy it. That is a huge change in a short period of time. Speaking of huge changes, you have most likely heard that Bank of America has opened three mini-branches that have ATMs and videoconferencing - but no human bank employees. They call these automated centers and there are two in Denver and one in Minneapolis. These offices are about 25% the size of a typical bank branch. If technology alone can't handle a request, customers can videoconference with a bank employee. Bank of America says that the automated centers are just a test, but it's clear that the banking giant is moving toward technology and away from human tellers. Five years ago, 65% of customer deposits were made at the teller window and 35% via ATM. Now about 50% of deposits are made at the ATM, 20% on mobile devices, and just 30% with bank tellers. Other big banks may soon be following suit. JPMorgan Chase estimates that 70% of the 400mm transactions its customers made in 2016 could have been handled through its mobile app or via another tech-based, self-service method. This is a direction it hopes to route more of its future transactions. No surprise, but all in all, involving technology could reduce bank costs by 75%. Community banks may look at this news as a warning of accelerated things to come. It may be. However, don't feel the need to automate all of your services just yet. There is still evidence that your focus on personal relationships and customer service is an important contribution to your customers. As such, it continues to play a vital role in a changing marketplace. Community banks regularly earn the best customer satisfaction scores in the American Customer Satisfaction Index. We know that customers value the personal touch. Interestingly, that's particularly true for millennials, according to a Bloomberg News article that says big banks lost 16% of their millennial clients in 2016. In fact, 88% of millennials say they'd like to do some or all of their banking in person. This seems to speak against the technology expectations of this generation. However, it may also show that technology only goes so far or isn't quite there yet. As some banks may look to automate more processes, you may want to look at what drives customers to switch banks. A 2016 Digital Scientists report found that fees were the crucial factor when customers changed banks. Customer service, online bill paying, and mobile banking were important, too. Take a look at your market to see where you can make reasonable efforts to attract new customers with meaningful enticements. Lastly, remember bank clients appreciate the convenience of automated banking, but convenience doesn't earn their loyalty. A CEB survey says that helping customers save the money to buy a car or a house, educate a child, and save for retirement can mean a 50% increase in loyalty. Wealth planning relies on relationships which is exactly the strength that community banks have. It may not be quite time to drive off in that shiny new bank technology just yet, but that said, we know it will continue to rev up all around the industry so keep up with the trends. Yields hopped down 2bp with the third Treasury auction of the week and softer than expected jobless claims. The CFPB is moving to broaden its regulatory reach into small business lending, as it seeks information into whether small businesses have access to credit. The move is raising eyebrows at banks across the country and it will be interesting to see how this all plays out. Wells Fargo said it plans to close 450 branches this year and next, as it looks to cut costs. TechCrunch reports online lending student loan startup SoFi is planning to apply for an industrial bank charter in the next month or may acquire a regional or community bank, as it seeks to get deeper into banking. The company has $1.9B in venture capital funding and recently raised another $500mm. It also recently purchased online banking startup Zenbanx (processes deposits and manages checking, savings and credit card accounts). A Fed roundtable event on this subject indicates regulators do not expect loan loss reserve forecasts to be right, but only that they be reasonable and supportable. Also, use of peer data for banks is permitted and expected, when bank specific data is missing or unavailable. Bloomberg reports JPMorgan's investment bankers are warning regional banks in a presentation they will begin to see an outflow of deposits in December and face a funding problem in coming years. As such, they suggest regional banks consider merging, ramping up advertising and investing in branches to keep growing and avoid potential liquidity issues down the road. ABA research finds the social channels banks use the most are: Facebook (90%), LinkedIn (69%), Twitter (52%), YouTube (38%), Instagram (22%), Google+ (17%), Blogs (14%), Pinterest (5%), SMS (4%) and Snapchat (1%). An ISACA survey of chief information security officers finds 82% feel their board of directors is concerned or very concerned about cybersecurity.